My 1999 Chevy Tracker has had an idle problem for almost a year now, yeah a whole year. The problem is that although the engine runs fine the idle speed gets too low and the engine wants to die. There’s no adjustment like the old days to set the idle, it’s all computer controlled and the mechanic who tuned it up last said it might need a new computer. So I finally did yet another Google search, actually several, to find a solution. Some mentioned it’s probably the EGR valve but one guy said he had this problem and used Sea Foam additive and the problem went away. So I bought two cans. One can went into the gas tank and 1/2 a can went into the crankcase (yep, you put it in to mix with the oil). It’s supposed to clean-out all the nasty carbon build-up and stuff. And voila! The car idles fine now. Guess I don’t need to call Car Talk. *Update: Okay, the car’s idle does get too low on a few occassions since but not nearly as much as before. Might need more treatment before we consider this patient cured. Yup, I'm in your old apt build. On the street side next to Glennon. Wish I could have had your old unit but it's occupied by the crooked parking guy. Oh yeah, my car still hesitates a little. Not nearly as bad as before, I'll probably put the other 1/2 of that can of Sea Foam in. Your air bypass solenoid valve may be gummed up. You can take it apart and clean it, or just spray a lot of air intake cleaner into the…air intake. 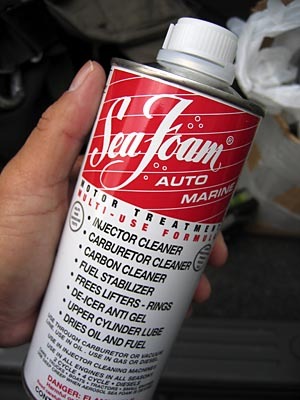 Did you pour Seafoam into your engine until it died, waited and then later went for a smoky test drive? That loosens up a bunch of junk in the engine.